There’s Even More Magnolia to Love at Target! With how much I love everything Magnolia and Target, they really are the perfect match made in heaven. Ever since their Hearth & Hand line came out in November, I’ve been religiously following along like so many others to see what they’re going to do next. Every time they add pieces to their line, I feel like a kid on Christmas morning. Needless to say, this time was no different. I am over joyed about this next step for Magnolia’s Hearth & Hand line at Target! Maybe, just maybe, we’ll all be Fixer Upper pros by the end of this. 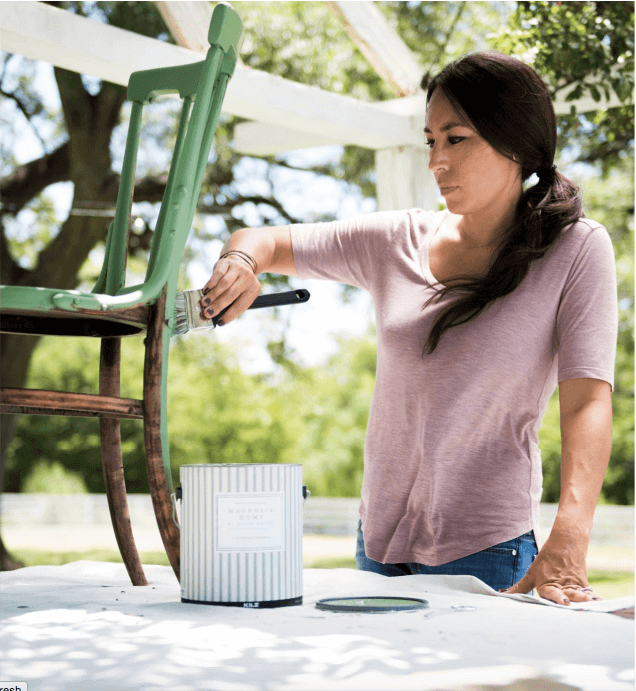 Paint, Wallpaper, and Hardware – Oh My! 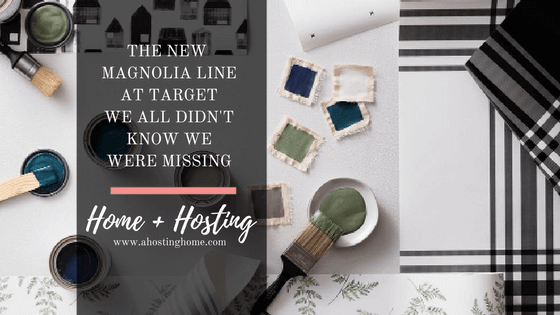 While the new items added to Magnolia’s Hearth & Hand line also included more spring decor, stoneware, and other spring hosting goodness, my favorite additions to the line were definitely the paint, wallpaper, and hardware. 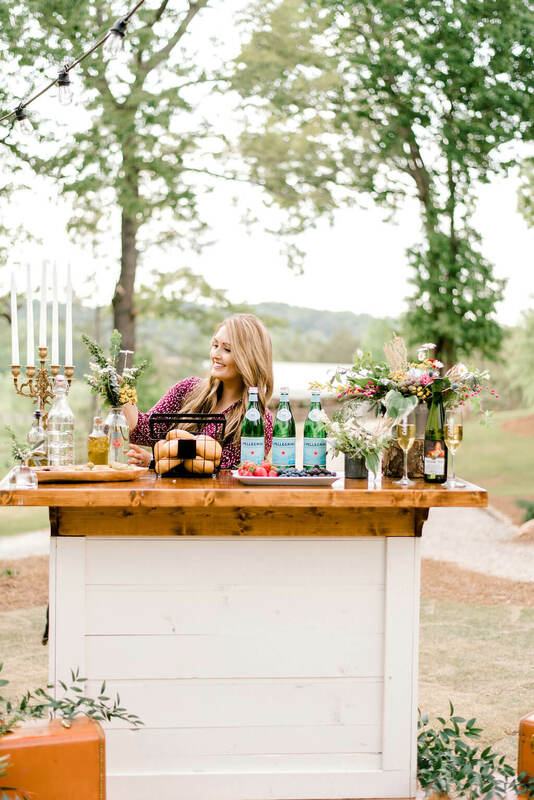 With a ton of styles and colors to choose from, there really is a little bit of everything to meet any farmhouse lover’s taste. As a huge lover of everything chippy and chalk paint, I think I am most excited about the Magnolia Home’s chalk paint. With so many projects currently under way over here at A Hosting Home, I can’t wait to try them out for myself! I’ve been loving everything sage this spring, and I’m already dreaming of how the Magnolia Green or Silverado Sage would look on the sliding barn door style night stands we are currently working on. They even have their own line of paint brushes as well as clear and dark waxes to finish it off. My only question now is: will Magnolia Home’s line of paint replace my love for Annie Sloan Chalk Paint? That’s a tough answer I’m dying to find out the answer to! Meanwhile, as excited as I am for the Magnolia Home paint, I’m also a huge sucker for some antique style drawer pulls and hooks. You may not think a detail so small could make such a huge difference, but it can! Changing out pulls, knobs, and hooks is often a relatively inexpensive way to refresh a space and give it a completely new vibe. You can see how an example of this with the farmhouse dresser makeover I did on the blog not too long ago. I can’t wait to snag some of these up for our current DIY projects that are in progress. Wallpaper Making a Come Back? However, one thing that this millenial doesn’t have much experience with is wallpaper. 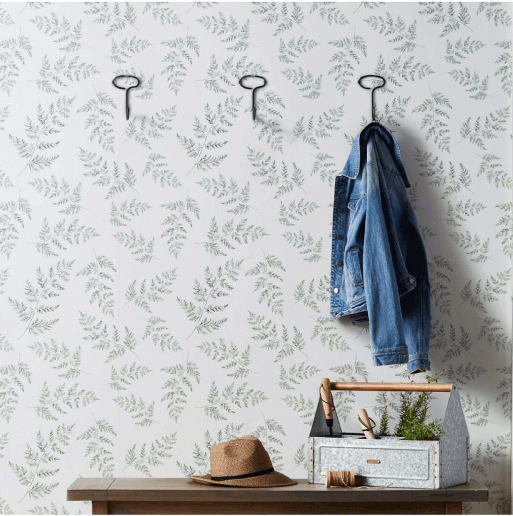 While I don’t think I’ll be snagging up the line’s new wallpaper to make a statement wall in my home, I can’t wait to experiment with it with some smaller projects. The first one that came to mind was using the white plaid wallpaper on the backing of a pair of bookshelves in my guest rooms. 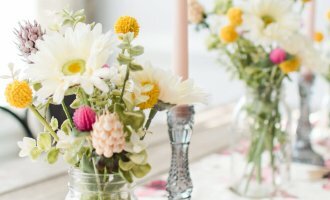 I’ll definitely share that DIY on the blog – whenever the time comes around! Leave it to Joanna Gaines to make wallpaper something that we’re dying to get our hands on! 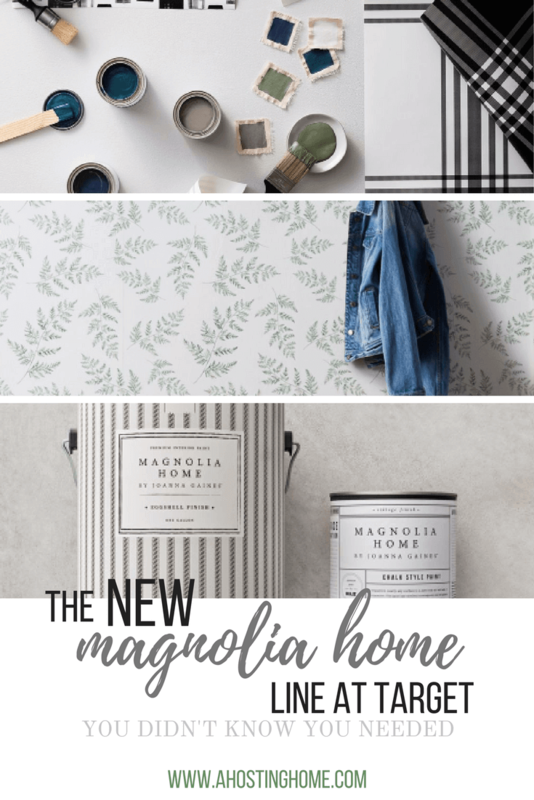 What do you think of the new Magnolia Home line at Target? I knew you would probably love it as much as I do. Is there something your dying to get your hands on? I can’t wait to try the paint and wallpaper for some upcoming projects over at A Hosting Home. Till next time, friends! 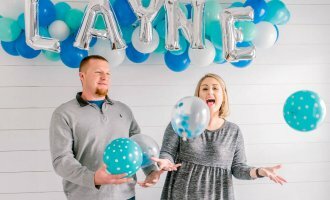 I love fixer upper so when i heard they were coming out with a target line, i was so excited! 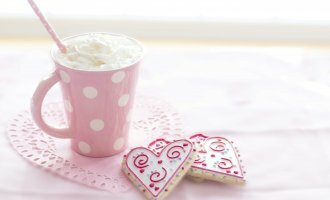 thank you for sharing their goodies! i think i’ll want to try their paint for our baby’s nursery! You’re so welcome, Alexandra! I am so glad that you found the post helpful and inspirational. 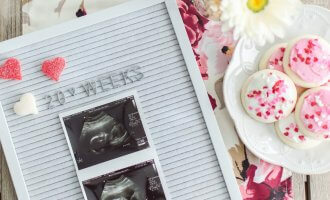 🙂 I can’t wait to hear what color you choose for your sweet baby’s nursery! I really like the paint colors. I wonder if they do sell them at my target. I am looking to paint some furniture and the colors are amazing. You should definitely check your local target, Rachel! I didn’t realize they had paint and wallpaper. So awesome that Target is carrying all of this. CAn’t wait to check it all out. Right! I was blown away when I saw the new line! IN LOVE! I didn’t even realize that this line was coming out! Where have I been?! And I’ve been really wanting to put up some wallpaper, so that’s absolutely fantastic news. I love the Magnolia line! Everything they make does so much to make a house a home. Those paint colors are so pretty and I love the soft patterns on the wallpaper.